Vote – you lucky American! You are here: Home / A Look Back in Time / Vote – you lucky American! 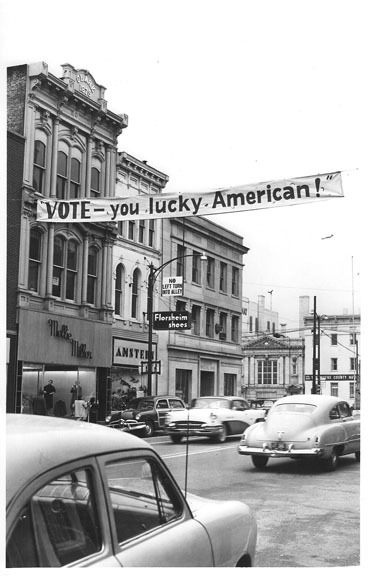 This banner hung across East Liberty Street in downtown Wooster to remind people to vote. We’re seeing more and more political advertising, debates, and talk shows these days. We thought we’d take you back to the days before Super-PACs! Can anyone tell us the time period of this photo, or what organization sponsored this banner? That’s great information — Thank you, Robert! Contest. The winner was Marjory Watson Temple of Knoxville Tennessee. Her family won a trip to Washington D. C. for the Inauguration. It was during the Eisenhower Stevenson campaign.